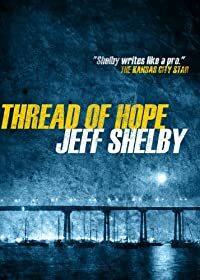 Thread of Hope by Jeff Shelby, a Mysterious Review. Review: Ex-cop Joe Tyler, an unlicensed private investigator searching the country for his missing daughter, returns to San Diego to help a friend, who is in a coma after being beaten by two unknown assailants, in Thread of Hope, possibly the first in a new series by Jeff Shelby. The police don't seem overly concerned with finding Chuck Winslow's attackers. Winslow, a volunteer girls basketball coach at Coronado High School, was out on bail after being arrested for beating Meredith Jordan, a female student with whom he may have been having an inappropriate relationship. Joe doesn't believe Winslow capable to such an act, and sets out to learn the truth from the only other person involved, Meredith. But just a day after Joe starts asking questions, Meredith disappears, prompting her father, a wealthy real estate developer, to hire Joe to find her. Thread of Hope is a superior mystery from a plot perspective, one that takes unexpected turns that lead to surprising outcomes. The clues to what really happened are deftly hidden in plain sight, with plenty of clever misdirection to keep the reader off guard. Joe follows his leads where they take him, making calculated — if not always wise — decisions as to next steps in his investigation. It's really well done. Though there is no confirmation this is the first in a series to feature Joe Tyler, the book ends with a possible clue to his daughter's whereabouts, leading him off to another part of the country … and presumably a second mystery. It will be eagerly anticipated and impatiently awaited.